nippers Nursery is a family run setting that aims to offer you and your child something a little bit different. The highly qualified and dedicated staff team are a bunch of girls who have been providing local families with a tip top service for just over 20 years. The nursery is owned and run by Julie Addyman and Carolyn Swales BAHon EYP who are on the shop floor everyday working directly with the staff team, children and families. Children aged from 0 - 11 years old attend a minimum of two days a week from 7.30 - 6.30 Monday to Friday. Free Play System - Six themed classroom areas of play - no age segregation or trapped in one room all day. Education funding is available for eligible 2, 3 and 4 year olds. Locally sourced home cooked food is prepared daily in our HBC 5* rated kitchen. Regular Family Socials and Events. You are welcome to visit at any time without making an appointment, take us as you find us, mid morning or mid afternoon. 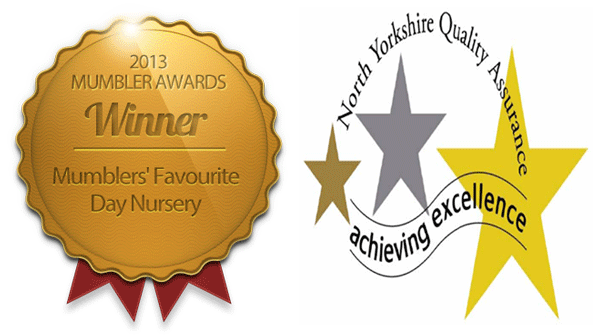 We are proud to be an award winning nursery within Knaresborough and we like to make sure that everyone else knows too! Click to find out more about all of the Awards & Achievements we have received!